Greetings friends and fellow crafters. 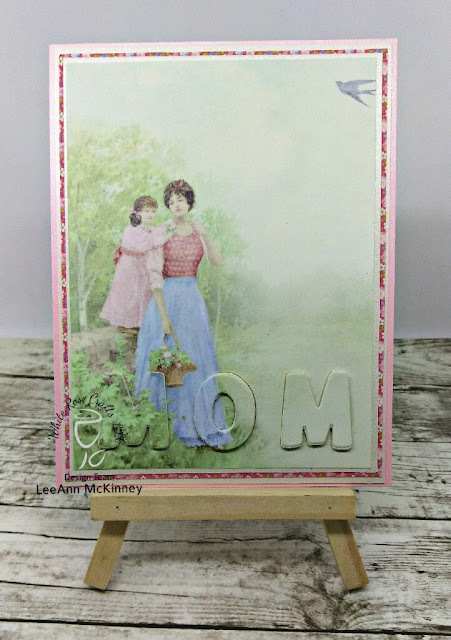 LeeAnn here today with another project using the White Rose Crafts May Card Kit. Using paper from the kit, I had a lot of fun making this card. Thinking with Mother's Day coming in the US in just a few weeks, this would be a good idea, and easy for anyone to replicate. I used Lawn Fawn Alphabet Dies called Quinn's Capital ABC's to die cut the word MOM out of the bottom portion of my top panel, along with a piece of fun foam, I then after adhering my panels together, I affixed the fun foam letters in the proper holes, and then attached the paper pieces to the top of that. This really did make for a quick and easy card.